Maybe Giancarlo Stanton’s high strikeout rate is justifiable when considering his home run efficiency. Isn’t that how he’s gained his fame in the first place? The New York Yankees certainly think so and it’s apparent that they’re more than okay with his mentality towards hitting. Stanton has been a monster this spring, batting .342 with 13 hits, four homers, seven walks, and 13 strikeouts. Over the weekend, the slugger hit a “stantonion” home run, smashing it over the left field fence and breaking his bat in the process. Look at this behemoth of a homer – absolutely crushed out over the middle of the plate, hooking it just over the left field pole. His power and strength are unparalleled in the MLB…well, maybe Aaron Judge is close behind, but luckily they play for the same team. 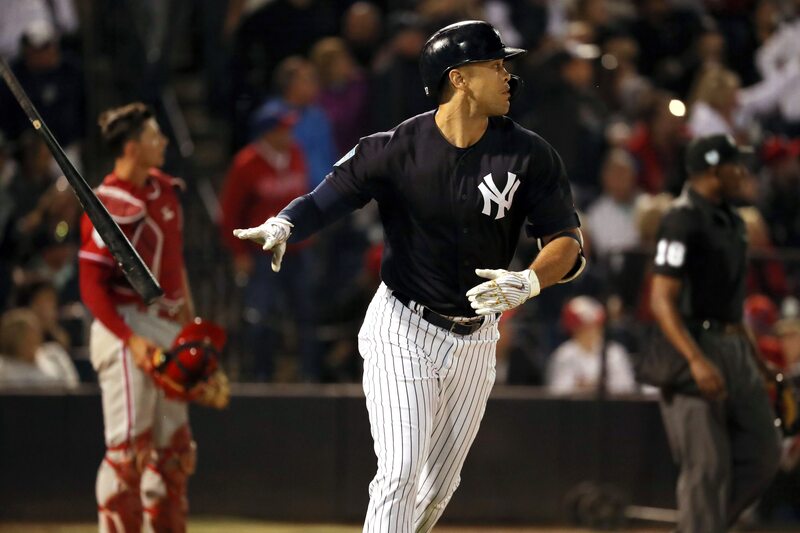 The 2019 season offers a chance for Stanton to improve upon his first season with the Yankees where he batted .266 with 38 homers and 211 strikeouts. The swinging and misses were troublesome last season, as he often left runners in scoring position and failed to come up clutch in moments of significance. Hopefully, he has gained confidence hitting in Yankee Stadium and can take his game to the next level. While diving into spring stats should be taken with a grain of salt, it’s still important to see how a player is progressing into the season. In 2018, Stanton struck out ever 2.9 at-bats, one of the highest rates in his entire career. This spring, he’s striking out once every 3.45 at-bats, showing a significant improvement. Now, the sample size is small enough to force caution when making assumptions, but it seems as if he’s seeing the ball more efficiently. One stat that can indicate a better eye for the ball is walking. Last season he earned a walk every 8.8 at-bats, but this spring he has walked every 5.4 at-bats. Everything involving his numbers has seen a positive trend this spring, which is exciting and could indicate a massive season for the slugger. Stanton and Judge together could be in for a historic season, meaning we might be in for a treat.